From being a little girl stealing tastes of cake batter, to my later discovery of the glorious Cold Stone Creamery cake batter ice cream, to now. Cake batter is one of my all-time favorites. It is the flavor of birthdays, it is simple and wonderful, pure happiness. 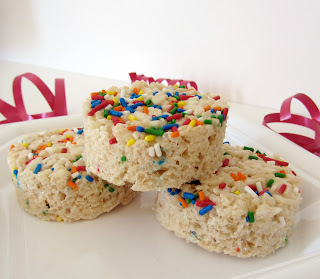 So, when I saw this recipe for Cake Batter Rice Krispie Treats, how could I ever pass it up? I found this recipe, credited to Kellogg's, at How Sweet It Is. The overall flavor is, of course, of Rice Krispie Treats. Yum. Then, you have the underlying flavor of cake. The sprinkles also add a subtle texture, though are largely tasteless. I ended up making these twice. The first time, I followed the recipe. The problem was that I used homemade cake mix. While homemade is almost always better, the flavor just wasn't strong enough to come through in these treats (though they were still delicious). A boxed yellow mix is the way to go here. Since I was going to make a second batch, I decided to make three more small changes. First, in researching these, I saw that some people increased the cake mix. That's a great idea - more cake batter flavor! Second, the recipe I use for standard Rice Krispie Treats calls for four tablespoons of butter instead of the three here. I think four is better (ooey gooey delicious), so four it is. And third, the original recipe calls for 10 oz (4 cups) of marshmallows. I always use the whole 10.5 oz bag in my standard treats, which I decided to do here, too. These are cute and tasty little treats. A great combination. Give 'em a try! 1. Line a 9” X 13” baking dish with parchment paper, allowing the paper to hang over the sides of the dish (for easy treat removal later). Grease or oil the paper and the two exposed sides of the dish. 2. Melt the butter over low heat in a large saucepan or stock pot. As soon as the butter is almost melted, add the marshmallows. 3. Melt the marshmallows over low heat, stirring constantly, until smooth. Do not overcook or the treats will be dry. Remove the pan from the heat. 4. Stir in the cake mix, about 1 tbsp at a time, until thoroughly incorporated. Return the pan to low heat. 5. Stir the cereal into the marshmallow mixture until well coated. Remove the pan from the heat. 6. Quickly stir in 2 tbsp of the sprinkles. Do not keep stirring or the sprinkles will melt. 7. Spread the mixture into the prepared baking dish. Press firmly and evenly. Top with the remaining 2 tbsp of sprinkles. 8. Allow the treats to cool for 30 minutes. Cut with an oiled knife or cutter. Serve or immediately tightly cover to prevent drying. Best served the same or next day.